Leonia, NJ – Today, Bergen County Executive James J. Tedesco III announced that Field Station: Dinosaurs will be joining the Bergen County Parks system. With the theme “9 Minutes from Manhattan - 90 million years back in time,” Field Station: Dinosaurs is a world-class family attraction that combines cutting-edge science with the creative minds of great artists and teachers to create a one-of-a-kind experience that's thrilling, educational and fun. 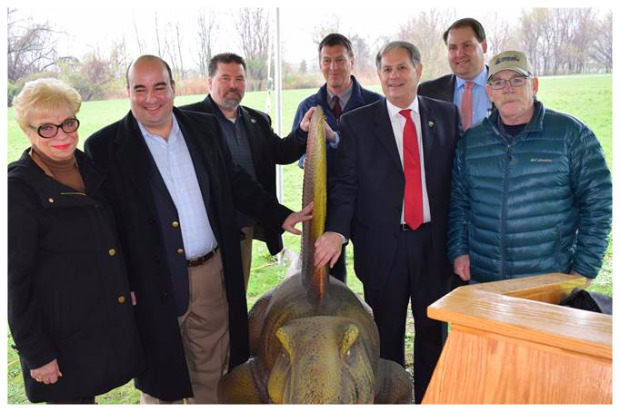 Field Station: Dinosaurs will proudly call Bergen County’s Overpeck Park its new home. Over thirty life-sized, realistic dinosaurs (including the ninety foot long Argentinosaurus) come to life thanks to the brilliant engineering of the world's leading roboticists and the imagination of their artists. Scientists from the New Jersey State Museum have worked to ensure that the exhibition encompasses the latest theories and discoveries in the fields of paleontology, geology, and environmental studies. Workshops, games and activities connect the story of the dinosaurs to our world today, giving new relevance to their lives and power to the tale of their extinction and at the center of it all is the fun, the joy, and the wonder of dinosaurs. The Field Station: Dinosaurs exhibit takes every family on a shared adventure - full of mystery, surprise and a sense of awe. “We are excited that Field Station: Dinosaurs will be remaining here in the Greater Meadowlands Region of Bergen County. Resident families and visitors who already enjoy a great county park system will now have another fine amenity. I commend the County Executive Jim Tedesco and his team for being forward thinking and eliminating obstacles that will keep the Field Station: Dinosaurs in our region” said Jim Kirkos, President Meadowlands Chamber of Commerce. Field Station: Dinosaurs will be establishing a temporary seasonal exhibition located on approximately 14 acres within the Henry Hoebel section of Overpeck Park, located to the north of Fort Lee Road while the site for its more permanent 35+ acre home is being designed, permitted and constructed within the Teaneck section of Overpeck to the south of De Graw Avenue across from the Glenpointe Hotel & Office Complex. Subject to design and regulatory approvals, the long term site is expected to come “to life” in 2018. Once reported to be considering a new home in Kansas, the retention of Field Station: Dinosaurs as a result of County Executive Tedesco’s commitment to the local and regional economy by growing jobs within Bergen has retained approximately 120 jobs and approximately $150,000 of tax revenue within the State of NJ. Overpeck County Park is Bergen’s largest single tract of parkland in Central Bergen at 811 acres spanning the municipalities of Leonia, Palisades Park, Ridgefield Park, and Teaneck, and encompassing Overpeck Creek, a tributary of the Hackensack River which feeds into the Meadowlands regional ecosystem. It is prized as one of the crown jewel’s within the Bergen County Parks System, attracting approximately one million visitors annually and will be further bolstered by the arrival of this major attraction and family destination.